On May 10th the German plan Fall Gelb (Case Yellow) was put into effect and so began the German invasion of the Low Countries, Holland, Belgium and France. By May 20 th 1940, after much fighting, Holland and Belgium had fallen and German Panzer Divisions were racing to Channel coast along the Somme. Despite fierce resistance from the French army and the 12th & 23rd Divisions of the British expeditionary force (B.E.F. ), the Germans captured Amiens by mid-day and had reached the mouth of the Seine at Abbeville by evening. By May the 22nd, the German forces of General Guderian crossed the River Scheldt and moved north to encircle the B.E.F and their allies at the Channel ports. The British forces went on half rations as they realized their desperate situation. But, the German Panzer troops were exhausted and short of fuel and supplies after their successful but frantic race into France. A brief attack at Arras by the British commander General Lord Gort on May 21st caused the Germans to believe they were facing a much superior force than the ill equipped B.E.F. On Friday May 24th, Hitler, realizing that the BEF was trapped, ordered the Panzers to halt south of Dunkirk and let loose the Luftwaffe to finish the fight and gain some of the glory. Meanwhile, Hitler and his Generals were looking south to Paris and the conquest of France. The scene was now set for the greatest sea borne rescue of all time, Operation Dynamo. On May 25th along the English southern coast an armada of small private vessels was gathering. Any boat capable of carrying troops was collected. Fishing boats, passenger ferries, car ferries, pleasure craft, sailing boats and even a Thames paddle steamer was there, over 700 in all. Many of these had not been to sea before and some were not designed for the sea as they were (flat bottomed) river boats . For five days, fishing boats, yachts, tugs and other little boats braved the bombs and strafing runs of the Luftwaffe to rescue 200,000 British and 140,000 French troops. Some boats made three or more journeys on their own amid dive bombing and strafing by the Luftwaffe. Unlit and unable to comprehend, or respond to naval signals by night, they risked being sunk by their own side. Oil tanks set on fire by the Stukas were a beacon for the Little ships to follow from England. The billowing clouds of smoke covered Dunkirk and the beaches, and many waves of dive bombers returned to their bases with their bombs as they could find no targets. The small boats negotiated the shallow waters off La Panne on the French-Belgian border, where no deep draught ships could approach and extracted the brave exhausted British Expeditionary Force, the French Army and a few thousand troops of the Belgian Army from the beaches of Dunkirk. On the beaches the engineer units built jetties out of abandoned trucks so that troops could clamber out to the boats. Huge lines were formed on the beaches when ships were available for embarkation. It was originally hoped that up to 45,000 men might be rescued. The actual total came to 338,226 men. The Royal Navy lost six destroyers, 24 small warships. Over 70 of the "Little ships" were lost too. 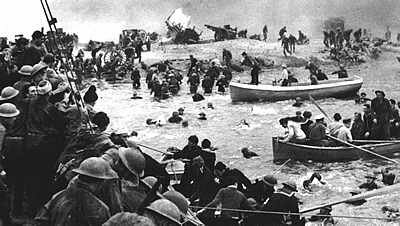 The evacuation owed everything to the unstinting bravery of the French troops fighting at the Dunkirk perimeter. It was their sacrifice, as well as that of heroic British units right on the Dunkirk perimeter itself that allowed so many to be taken off the beaches. The German Luftwaffe has spent the last week making life hell for those trying to leave Dunkirk. The RAF lost some 60 pilots in these actions and many more planes. The feared dive-bomber, the Stuka, would have done a lot more damage had it not been for the Spitfires, the Hurricanes and the Defiants. The German bombers would have had a field day with the massed ranks of Allied soldiers on the beaches if they hadn't had Fighter Command to deal with. Winston Churchill, British Prime Minister, addressed the House of Commons and reminded the gathered Members of Parliament that, "We must be very careful not to assign to this deliverance the attributes of a victory. Wars are not won by evacuations." But it would always be known as ‘The miracle of Dunkirk’. The nine days of Dunkirk stopped what was a disastrous campaign becoming a tragedy of epic proportions. If the army had been lost there then so too could have been the war. Britain could in time replace the huge amount of equipment lost but not her professional army. 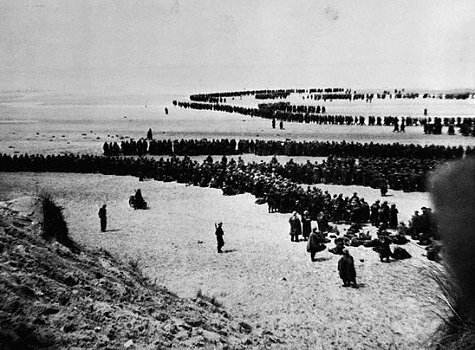 Left behind on the beaches of Dunkirk were some 2,472 guns, 84,427 vehicles of all kinds and 657,000 tons of ammunition. These few pages only scratch the surface of the Dunkirk evacuation. They cannot convey the danger, exhaustion, heroism and sacrifice of all who were there. One book that comes nearest is "The Miracle of Dunkirk" by Walter Lord. Please follow the links below for more information about Dunkirk.